Transitional design is best described as a new take on old classics and serves as the foundation for elegant and purposeful design. A home designed in transitional style may include a mix of ornate curves and clean lines, smooth industrial surfaces and textured fabrics. The options are endless, which offers our design team a challenge we love: blending the best of contemporary and traditional design to create a home that’s as unique as every client. Here are some hallmarks of transitional design and some suggestions (and inspiration!) to help you incorporate it into your home. A signature element of transitional style is using neutral colors as the room’s backdrop, to allow bolder statement pieces and colors to complete the design. Serene shades of taupe, grey, camel or white create a serene atmosphere, while more ornate architectural pieces and accent colors can speak to the individual’s unique taste. The pale taupe and grey walls created a sophisticated frame for the dark wood furniture and blue and yellow accessories. We love how the elaborate lines on the throw pillows, dining room chairs and chandelier are striking without making the room seem too busy. Transitional style is all about incorporating diverse architectural elements that reference the opulence of traditional design in a sleek, modern way. Think of a chaise lounge with straight legs but a subtly curved backrest, or a rectangular marble dining table offset by upholstered chairs. To complete the room, we set an orchid with a subtle curve next to a round-bodied statement vase atop an industrial coffee table to play with this contrast. When incorporating pieces and accessories from diverse periods and styles into a transitional space, playing with different textures, instead of a broad array of colors, can create visual interest and movement without being distracting. A carefully chosen rug in a neutral tone can accentuate polished hardwood floors, without overwhelming the space. 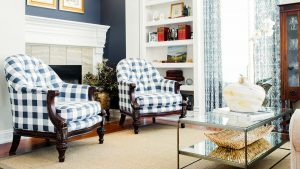 Texture can also be implied through patterns, as seen in the damask-printed curtains and gingham armchairs, which are both distinctive despite having the same color palette. Our designers paired this buffet, with brass fixtures and an antique silhouette, with a sleek modern lamp in the same shade of muted gold to bridge the gap between both styles. 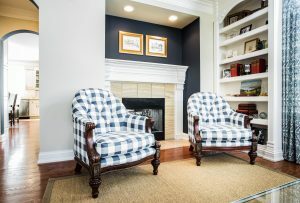 The little alcove by the fireplace in this example home showcases how simple colors allow personal touches to shine through. The embellished ceiling lamp above this dining table complements the matching square lamps on the sideboard perfectly. The fusion of modern and traditional elements allows transitional style to work in any home, with plenty of room for personal flair to shine through. bb Interiors specializes in home redesigns, and we’re happy to help you reimagine any room, or tie together your whole home. Contact us for a consultation today.